Well, folks, I’ve done it. I’ve sold my CTS-V Wagon. At least, I think I’ve sold it. What’s actually happened is that I’ve spent the last week on the phone with the buyer’s bank, who has insisted on verifying every single portion of this transaction, including my date of birth, my home address, the hypothetical name I would give a dog if I had one, the total number of little hairs on my right leg, etc. I find this highly unusual considering the buyer and I have the same bank, a fact I’ve brought up with them repeatedly. But they’re undeterred. They will probably call before I finish this column and ask for my favorite movie villain. And they make a good point. There isn’t a huge market for this car. But damn, there should be, as I’ve discovered over the last six months behind the wheel. But while the video touches on performance and drivability, I’m going to discuss a few of the car’s finer points right here in good, old-fashioned, traditional print. Prepare yourself. Actual repair costs were relatively small. I had to patch a tire ($25), get an oil change ($52), and – here’s the kicker – replace one flat rear tire for a whopping $470.34. So my lesson to you future CTS-V Wagon owners is for God’s sake don’t poke holes in your tires. Depreciation was a little more expensive. It’ll total around $4,000, which sounds like a lot until you realize that I drove the thing 12,000 miles in the last six months, including 6,300 miles to California and back in August. 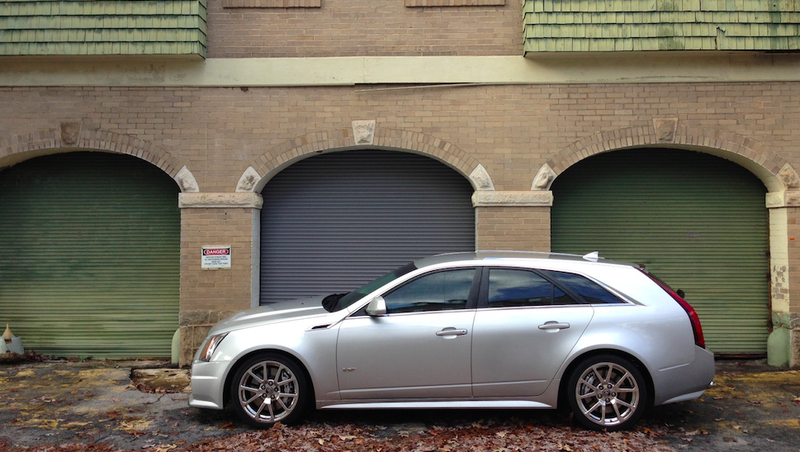 So here’s another lesson for future CTS-V Wagon owners: if you want to save your money, don’t drive your CTS-V Wagon. And especially don’t put gas in it. You may be wondering why I’m selling the V Wagon. This will especially perplex regular readers, who know its departure leaves me with just a Nissan Cube and an unreliable SUV, both of which are highly prized by middle-aged women, but not as appreciated by, say, the kind of person who reads Jalopnik. And it’s true. With the V’s departure, my life won’t be quite as exciting as it is today, what with all the pushing down my foot and listening to the transmission shift for me. But my reasons for selling are nuanced and complicated and highly intricate, and also my accountant called and said: “Doug, you idiot! You need to sell this thing by the end of the year if you want to deduct any expenses from your taxes.” And boy, do I ever! So the V Wagon has to go. But there’s good news: selling the V Wagon frees one of my rutted, alley-access parking spaces for something else! Something similarly exciting! Something fast! Something unique! Something… with a manual. To know me is to know I love cars, and at last count I’ve had more than two dozen. The CTS-V Wagon is easily in the top three. Now if you’ll excuse me, the bank is calling to ask how I’ve arranged the furniture in my living room.